Starfish bathroom accessories can create a stylish, whimsical feeling in your ocean-themed lavatory. As one of the more easily recognizable animal shapes, the starfish is a sea creature that is enjoyed by children and adults alike. 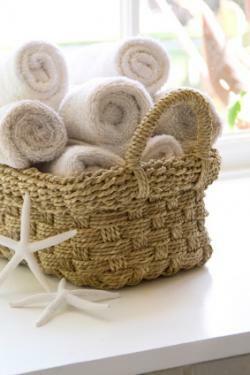 Bringing in just one of these classic beach shapes will have a positive impact on almost any bathroom design scheme. Not only are starfish a popular ocean dweller, they are also an intriguing creature classified as a marine invertebrates. Living in all the world's oceans, there are roughly 1,800 different species of starfish including the crown of thorns starfish and the blue starfish. Habitats that support starfish colonies range from coral reefs to kelp forests to the sea floor. This diverse creature has fascinated people for centuries, and starfish continue to be a part of modern home décor. Aquatic themes are a natural spot to make use of starfish bathroom accessories. Fashionable starfish items can embellish almost any seaside motif such as beach, nautical, deep sea, Cape Cod, sailing, or tropical. Even just a simple shadowbox with a stunning starfish will make a wonderful artistic statement on a lavatory wall. Quality Shells offers a wide assortment of real starfish in a variety of sizes and colors. Check out their dyed starfish for a colorful touch or try the natural beauty of the jungle, sugar, knobby, or blue finger starfish. Almost any part of a bathroom can be touched by the splendor of the starfish. Many retailers, catalogs, and online stores carry a wide assortment of oceanic theme bathroom coordinates which feature the humble starfish in their designs. Some of the available starfish bath items on eBay include shower curtains, light switch covers, soap dispensers, soap dishes, curtain rings or hooks, toilet seats, towel sets, cabinet hardware, and bath mats. The Sea Breeze bathroom ensemble includes a refined, airy beach theme with plenty of starfish charm. The collection includes numerous items which feature starfish, such as the shower curtain, tumbler, tissue box cover, shower curtain hooks, towels, rug, and waste basket. For a refined starfish motif, add some floating shelves in a white or cream finish. Lean different sizes and colors of starfish straight across or layer them on the shelf with smaller starfish resting on larger starfish. You can also use a starfish as a stamp to decorate the walls for an understated paint treatment. Seashells and starfish can also be glued on a long piece of pretty ribbon and hung vertically on a bathroom wall. Keep the décor straightforward and let the simple loveliness of the starfish shine. An attractive collection of seashell and starfish themed accessories can be found in the Touch of Class online catalog. The available seashell accessory selection includes bath coordinates, bedding, wall art, rugs of all sizes, plaques, and candleholders. 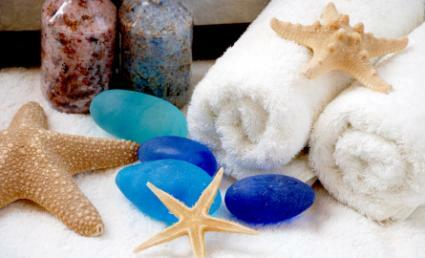 Their "At the Beach" collection of starfish bathroom accessories would make a complete room décor package.